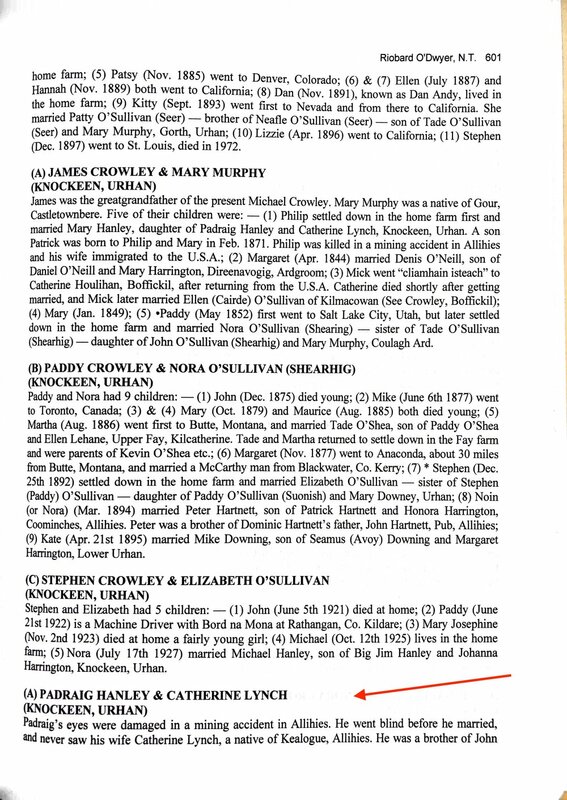 I am 90% certain that my 4th great grandfather, Padraig Hanley, is described on page 601 of Riobard O'Dwyer's Annals of Beara, Volume II. My best guess is that he was born around 1810 in the townland of Urhan, County Cork, Ireland. All three volumes of O'Dwyer's stunning Annals of Beara can be purchased directly from Lulu.com. There is a longer story here I hope to tell some day. This is the short version. For some time my genealogical "brick wall" was my 2nd great grandfather, Patrick Hanley (abt. 1857-1923). He was the 2nd husband of my 2nd great grandmother Ellen Sullivan Kelly Hanley (1850-1938). After her first husband died, Ellen married Patrick who was one of the young Irish lodgers staying at the boarding house she ran for Irish immigrants in Atlantic Mine, MI. 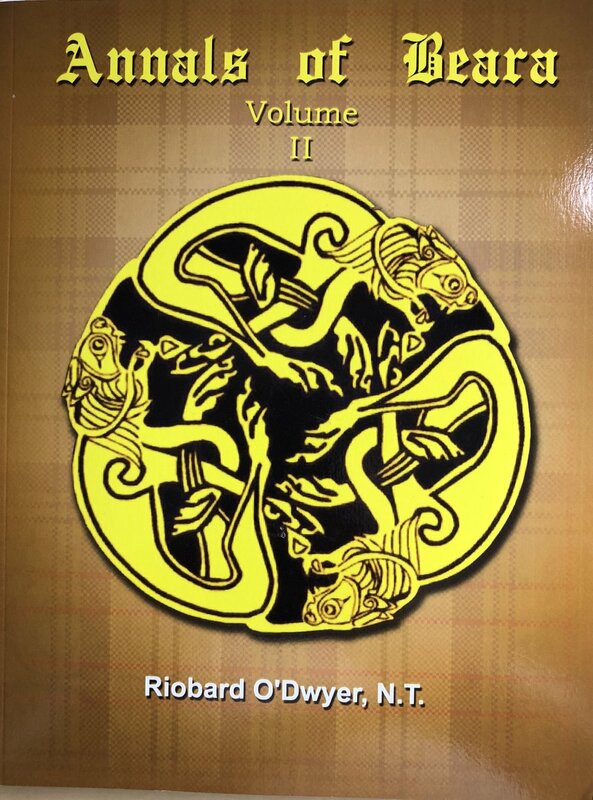 You read about my discovery Ellen's parents in Volume I of Riobard O'Dwyer's Annals of Beara Volume I here: My 3rd Great Grandfather, Denis Uonhi (also Green and O'Sullivan), of Ballydonegan, County Cork, Ireland (b. 1810). Other than a death certificate and a few census records, however, information on Patrick had been elusive. This changed when I began emailing with an Ancestry DNA match estimated to be a 4th-6th cousin. Born in Ireland, she was now living in Canada. Between the information that she provided and my painstaking scanning through 100s of unindexed pages of O'Dwyer's work, I discovered the following entry. Note the very last last entry on the page. "Padraig's eyes were damaged in a mining accident in Allihies. He went blind before he married and never saw his wife, Catherine Lynch, a native of Kealogue, Allihies." The entry does not give Padraig's year of birth, but you will see on the following page (602) that his children were born in the 1840s. I am guessing his son John Jack Hanley (my 3rd great grandfather) was born around 1840. He married Johanna O'Dwyer. Their children are detailed in the first full entry of the next page, 602. Their first child, Patrick, as described above was my 2nd great grandfather. But, he is no longer my brick wall (hopefully!). For those keeping score at home, here is what I think this branch of the family tree looks like with Padraig in the upper right corner. Five Generations of Hanley Men: Padraig > John Jack > Patrick > Michael John > Michael John Jr.
My paternal grandfather, Michael John Hanley Jr. (1924-2015), is in the bottom row. There are still some details to sort out here and some evidence to gather. But this has opened up whole new avenue for me to explore. Accidents and even death were common place in the mining industry in Ireland and the U.S. How did injuries like Padraig's (blindness) impact families over the years? Do I have this part of my tree right? All signs point to yes, but have I missed something? How can I best confirm some of these details with historical documents? What do you think, feel, and wonder about as you consider these generations of Hanley fathers? Could I have made this discovery without DNA evidence? This is the 29th of 52 weekly posts planned for 2018. It was inspired by the #52Ancestors writing challenge issued by professional genealogist, Amy Crow Johnson. The challenge: once a week, for all 52 weeks of the year, write about a relative in your family tree. There’s an oval framed photograph in my family collection that I’ve not been able to identify. Here’s the story of how I took it apart looking for clues. Lydia Schmidt McNamara (1876-1961) was an elegant woman with a fondness for hats, planes, and jewelry. There is photographic evidence that she fancied shuffleboard as well. The Psychogenealogist Pic of the Week (#14) - Alma and Ida, 1971.